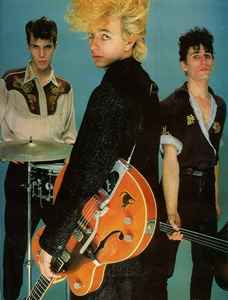 The Stray Cats are a rockabilly band first formed in 1979 by guitarist/vocalist Brian Setzer (Bloodless Pharaohs/Brian Setzer Orchestra) with school friends Lee Rocker (born Leon Drucker) and Slim Jim Phantom (born James McDonnell) in the Long Island town of Massapequa, New York. The group, whose style was based upon the sounds of Sun Records artists from the 1950s and heavily influenced by Bill Haley & His Comets, had little initial success in the New York music scene, and had to move to England before they saw any success at all within the nascent rockabilly revival there. The group had several hit singles in the U.K. and the U.S. during the early 1980s.